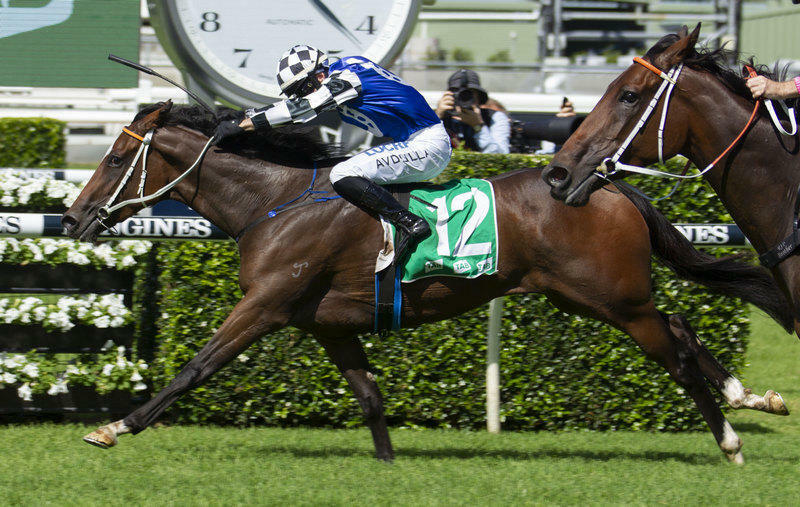 The $200,000, Group 3, TAB Adrian Knox Stakes (2000m) witnessed a major boil-over when the Kris Lees-trained Aliferous (by Hinchinbrook) landed the traditional Australian Oaks preliminary at the handsome odds of 40/1 on Day 1 of The Championships at Royal Randwick in Sydney. Winner of a Newcastle maiden over 1200m as a late season 2-year-old and a Tamworth Class 1 event in more recent time, Aliferous delivered a devastating late finish in the Randwick straight to overhaul her rivals and post a narrow victory. In an evenly matched contest that witnessed the first 10 horses across the line finishing within two-and-a-half lengths of each other, race favourite Amangiri (by All Too Hard) claimed second and Maracaibo (by Redoute’s Choice) third. ontested on a Soft 7 surface, Aliferous recorded a very moderate time of 2m07.73s in winning the 10-furlong event. The final 600m sectional came in at 37.30s — a further illustration of how rain-affected the Randwick track was playing during the early stages of the feature program. In terms of his ride, Avdulla said: “She minded her own business out of the back there. I thought she was going to run a good fourth or fifth at the top of the straight, but they rolled along at a good speed and they hit a wall at the 150m. She was the fresh horse on the scene and was good enough to run over them. Winning trainer Kris Lees seemed to be less surprised by the result, claiming after the win: “You don’t know where they come from this time of year. “She was really good at Kembla [last start] off the track. It was a good conditioning run for a testing track today. She got through the ground, so there are a lot of positives. The Adrian Knox victory of Aliferous saw the filly come right in to contention for the Australian Oaks, for which tab.com.au slashed her odds from $51.00 to $15.00. Raced by Australian Bloodstock, Mr K Coughlan, Mr N B Whatmore, Mr M B French, Mr M Haggarty, Mr G J Rigby, Mr A M Rhodes, Mr C J Sneddon, Mr A G Cammarano, Mr D Girvan, G & M Barnett Racing, Maxim Racing No 2, Mr J Lunn, Mr D J Love, Mr M J Mclean, Mr J P Moffat, Mr S J Oliver, Pacific Boss, Willow and Hearts Racing, Aliferous is now the winner of three races and $184,780 from 10 career starts. The winner Aliferous was returned at a starting price of $41.00, the runner-up Amangiri at $2.70 fav, and the minor placegetter Maracaibo at $21.00. Official margins on the race were a half-neck and a long head.